ALECTRONICS has been involved in the stewardship of Mother Earth for over two decades now, even before their corporate charter was established. Concern for the quality of Air, Food, Land and Water; along with providing Hope for Under-served Veterans and Students of North County, has always been their top priorities. Since the mid-nineties, ALECTRONICS has been involved and in game-changing technologies that had the potential to change existing monopolistic petroleum industries worldwide. “Aqua Fuel” was an automotive combustible fuel that operated on regular water and burned clean, zero-emissions exhaust. Magnetic Levitation (MagLev) Wind Turbines and MagLev Trains were also reviewed. Discussions with China occurring back in 2007 concerning technology transfer and cooperative manufacturing. That particular MagLev Wind project was discontinued due to 1ARCs insistent desire to keep the technology in the United States. Currently, MagLev is still on the table and General Atomics (GA) in San Diego will provide the technical assistance required to fabricate the first Low-speed MagLev Train Rail in California. Talks have already begun with North County Transit District (NCTD) concerning the possibility of creating a joint MagLev / NCTD collaboration. Plans are underway to build a 21st century transit center in Oceanside in close proximity to the existing transportation infrastructure. The proposed 1ARC/GA MagLev Train works as a green / non-exhaust, non-polluting solution to move people efficiently from our newly proposed Oceanside ALECTRONICS Transportation Inter-modal Center (OARTIC) to the existing Oceanside Transit Center (OTC). . 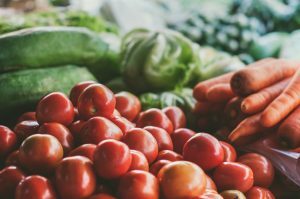 In the area of food quality and production; A Hydroponic Organic (Vertical Density) Food Production Enclosure utilizing a controlled temperature environment was designed by COO, Albert Sanchez, for Dr. Girish Panicker of Alcorn State University, Mississippi. The 1ARC Agri-Thermosphere (1ARCAT) is capable of producing more food per acre than existing conventional farming methods. 1ARCAT preserves water and lands in a protective pure, organic environment free of pesticides. Because 1ARCAT was originally designed for the higher winds in Mississippi, it’s durability and super-strength qualities allow it the capability of withstanding hurricane strength winds up to 180 MPH. 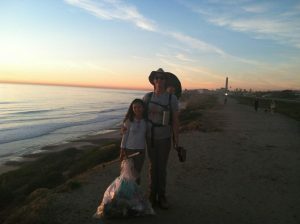 Presently, 1ARC has teamed with 1Peace-At-A-Time to provide Beach and Land Clean-ups along the Coastal Lands (shore and cliffs) of North Ponto State Beach in Carlsbad, California. For nearly a half-year now, 1ARC and 1Peace-At-A-Time have initially designated approximately one-third of a mile of North Ponto State Beach (Dave’s Beach area is the Glider-port for Remote Controlled Devices) as an area they agreed to focus on. Picking up Trash & Recyclables is one on-going activity. 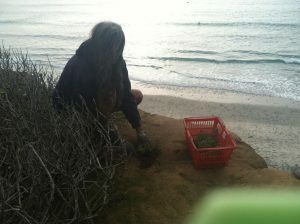 Planting Seedlings of Various Plants on the Bluff to combat erosion, is another crucial activity. Both need volunteers. When it comes to planting the hillsides to combat erosion… this is a monumental problem in south Carlsbad beaches and further south in Leucadia and Encinitas. 1ARCs first targeted area focuses on North Ponto (Dave’s Beach) State Park area. As 1ARC and 1Peace-At-A-Time builds their Volunteer base, and their first target area is Clean & Pristine and Planted extensively with ground cover; they’ll be ready to tackle a second target area. As they build their teams and expand their reach, progress will be made to minimize Coastal erosion. This planting activity of life and care for Mother Earth is desperately needed during these times of unpredictable weather conditions. 1ARC and 1Peace-At-A-Time have made great progress so far. 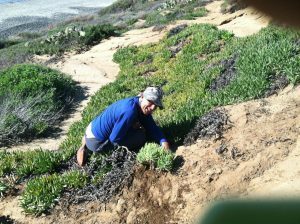 Several varieties of plants and ground-cover (over two hundred seedlings and cuttings) were planted along the cliffs and bluffs of the targeted area in January 2017, just before the storms started giving the new plantings the best chance to take root. 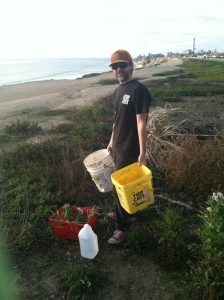 To maintain our current and future plantings, we need your assistance now. Please help us with your Donation of $10 or more; or by volunteering your time as an unpaid volunteer. 1ARC will be asking the Home Depot Foundation for assistance by providing the plants and seedlings of ground-cover required for future plantings. The seedlings and cuttings used in the initial plantings were donated by 1ARC and 1Peace-At-A-Time for the first three plantings. Local reaction to their efforts have been noticed with gratitude by South Carlsbad residents. Several State Park Lifeguards and other State workers have applauded their collaborative efforts. Hydrology Modification is the hottest topic under discussion for municipalities today. How can we save water? How do we collect, filter, store and reclaim store drain off and rain water in new public developments? Even with recent rains, water reservoirs are still below normal capacities (except for Northern California). If we collected some of the 60% of the water that flows into the ocean, we could replenish our water reservoirs more efficiently; with a potential of literally saving millions of gallons of water per season. Even though the drought is officially over by the Water Resources Board, San Diego County will keep Hydrology Modification on the forefront of new developments. 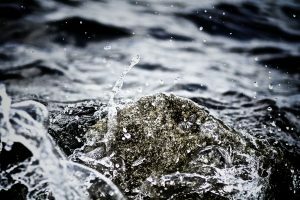 Increasing water demands of new projects will keep Hydrology Modification Plans in the spotlight. A year ago, The County of San Diego identified and set the precedent for the latest Hydrology Modification Regulations. Municipalities across the San Diego region have adopted the counties strict water conservation guidelines and 1ARCs Matt Miller, P.E., is up to speed on these regulations. The proposed 1ARC Veterans ePark will include an innovative 21st Century Parking Garage which will provide a union of many different modes of transportation. The proposed Oceanside ALECTRONICS Regional Transportation Inter-modal Center (OARTIC) will connect with existing Oceanside Transit Center (OTC). via NCTD Bus, Lift and Taxi lines to start and eventually the addition of the Low-speed 1ARC MagLev Train that will shuffle passengers from OARTIC to OTC, only minutes away. The proposed OARTIC will be capable of capturing rain water on the rooftop level and filtering that dirty, oily rain water through an innovative planter system and moderate course hiking trail will be integrated in the perimeter walls of the parking Garage. The proposed new buildings and streets will capture rain water. Systems will be constructed to filter that water After filtration, the water is saved via underground storage reservoirs. That water is reused for landscaping purposes.